If you have been following our RSS feed this week, you would notice that Camila recently published her review of Marble Math, an excellent math app for juniors between the age of 9 and 12. While it is easier to agree that Marble Math is indeed a fun way to practice various math concepts, most parents would also find it difficult to measure whether it's appropriate for their juniors, content-wise. Today I would like to share my perspectives on another app in this series, Marble Math Junior, which is aimed at juniors between the age of 5 and 8. Different kids may have different learning speed and school curriculum, so I prefer to inspect educational apps like these by figuring out what their contents are before determining whether they are appropriate for one particular individual or not. 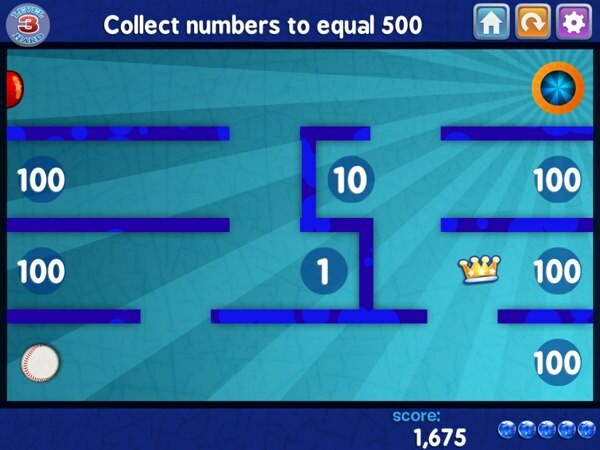 The game provides math problems that must be solved by navigating through a series of mazes using a marble, in order to collect the correct answers. There are two ways to control the game; your junior can either choose to drag it using their finger or roll it by tilting the iPad. If you're already familiar with the gameplay above, I will start discussing on the four aspects that would help you determine which Marble Math version is suitable for your juniors and when you should give it to them. Having both versions of Marble Math installed on my iPad really helped me perform this comparison. Even though the "senior" (non-Junior) version has more advanced contents, the Junior version offers unique and exclusive contents as well. In Marble Math Junior, your juniors will learn to recognize shapes; understand the equivalency of dice, tallies and ordinals to their numeric counterpart; and compare clock faces. The reason why dice and tallies are more appropriate for the Junior version is because they can effectively represent numbers up to 6 and 10 respectively, whereas the "senior" version needs other symbols (like Roman numerals) to represent larger numbers. As far as I know, I haven't seen ordinals (e.g. 1st, 2nd, 3rd, 4th, 11th, 21st, etc.) being used in the "senior" version; if you're trying to introduce this concept to your juniors, Marble Math Junior is suitable for you. However, despite everything I laid out here, it is still possible for the developers to reuse shapes and clock faces in future "senior" version updates. There are so many concepts in math that it could be difficult for juniors to thoroughly understand each and every one. For this reason, several concepts are included in both versions of Marble Math to provide additional practice for your juniors. I will list these concepts below so that you can decide whether you should get the Junior version in addition to the "senior" one. If you think your juniors need more practice on these problems, you might want to get the Junior version in addition to the "senior" one. On the other hand, you might also want to consider contents that are not available in the Junior version -- these include Roman numerals, math operations involving two-digit numbers and up to three operands, and negative numbers. The "senior" version also introduces division as a part of the math operations featured in the problems. If you think your juniors have already been exposed to these concepts in their curriculum, you might want to consider getting the "senior" version too. While the Marble Math series is available for sale worldwide, it contains math problems that matter only to US users, e.g. addition problems involving coins and notes from the US currency. I believe this is a chance for the developers to improve the app by supporting other currencies as well. Both versions of the Marble Math series are great math apps for your juniors to practice as they are learning new concepts. By understanding what each version offers, I hope you can decide which one you should get for your juniors. I believe that you should get an app for its contents and the current learning state of your juniors, rather than the suggested age range supplied by the developer. Therefore, don't hesitate to get both versions if you really believe that your juniors can benefit from each of them.